In January 2011 I posted this little “series” story. The only thing different about it now is that it has a new ending. 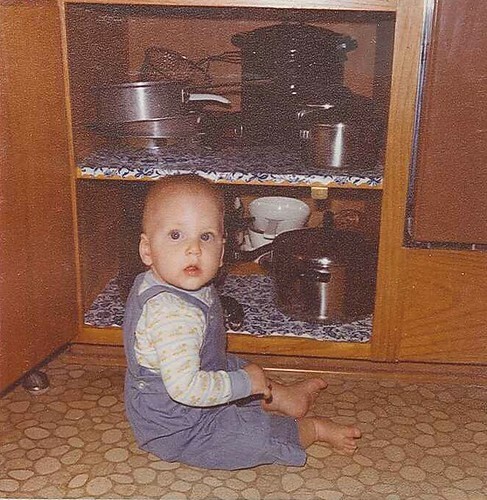 circa 1977 • Baby Taylor gets ready to pull the pans out of the cupboard. 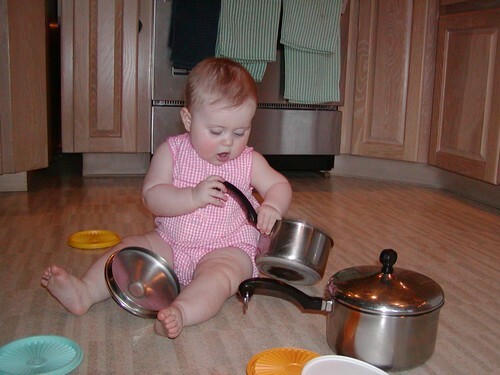 circa 2004 • Baby Cassidy—the same pans/lids offer entertainment. 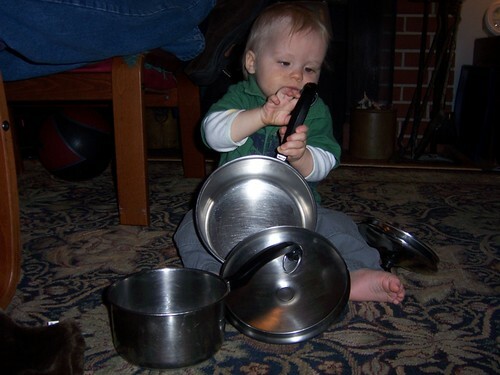 circa 2009 • Baby Oscar investigates our 43-year-old cookware. Chances are another babe or two will play with these pans before they become obsolete. circa 2012 • Now Baby Sage finds them entertaining. 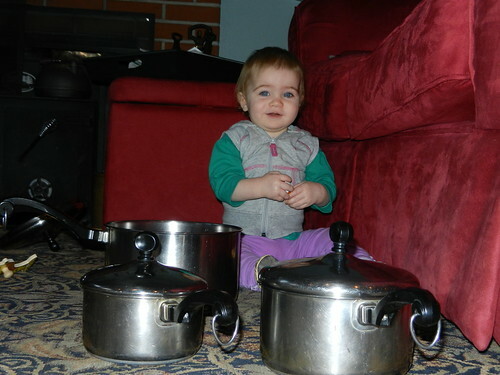 Who needs toys when you have a 45-year-old set of pots and pans to play with? Hey, I recognize those pans and I have a set too–save the one I left on the stove while boiling “water” until I melted the aluminum clad bottom into one huge Hershey’s Kiss! The pots and pan cupboards are the favorite ones at our house too. I’m pretty convinced that toys are just a marketing gimmick – between wooden spoons, jar ringers, tongs, pans, and veggie steamers (those old metal ones that have ‘wings’ that fold up and down and look like a space ship) a kid doesn’t need much more (maybe a stick). We have pictures of Jesse and Emma making ‘potato soup’ this year at Christmas. Yum….